The pay and conditions consultative ballot opens on Monday 18th March. 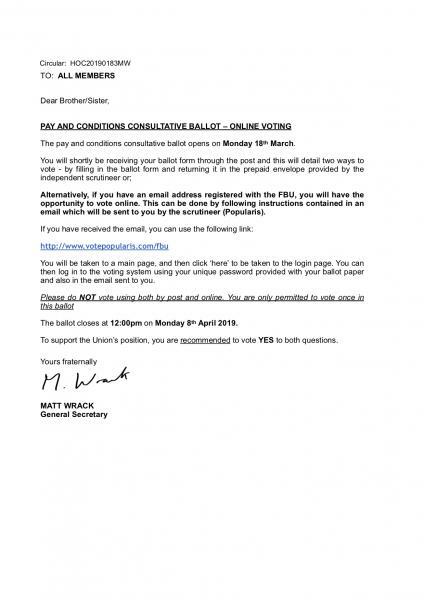 Alternatively, if you have an email address registered with the FBU, you will have the opportunity to vote online. This can be done by following instructions contained in an email which will be sent to you by the scrutineer (Popularis). You will be taken to a main page, and then click ‘here’ to be taken to the login page. You can then log in to the voting system using your unique password provided with your ballot paper and also in the email sent to you. The ballot closes at 12:00pm on Monday 8th April 2019. To support the Union’s position, you are recommended to vote YES to both questions.